Age: A prospective member must have reached her 21st birthday as of May 31 of the year for which you are applying. Residency: A prospective member must reside within the Oklahoma City area or suburb thereof. Specific boundaries are Seward Road to the north, Banner Road to the west, Pottawatomie Road to the east, and Indian Hills Road to the south. If you reside outside these parameters and wish to apply as a “Non-Resident” Provisional, please email our Provisional Admissions and Training (PAT) Chair. 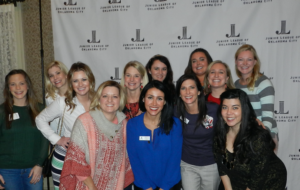 Sponsors: All prospective provisional members are required to be sponsored by a woman who is currently in good standing of the Junior League of Oklahoma City. This member can be an Active or Sustaining member. Prospective members may also be sponsored by an Active or Sustaining Member from another AJLI League with a letter of recommendation from that member. Prospective members who do not have a sponsor must submit three letters of reference. All eligible applicants will be invited to join our 2020-2021 Provisional program, which will begin in April 2020 and be completed in May 2021. To begin this process, please click HERE. Click HERE to request more information about our 2020-2021 Provisional Class, beginning April 2020.